David has been Pastor of Rock Valley Christian Church since its founding in 2005. In addition to serving as Pastor, he has worked for a national consulting corporation since 1989, where he currently serves as President. After speaking as an itinerant teacher, preacher and radio host for many years, David was led to serve the church of God in the Temecula Valley with the help of his wife, Stephanie, and friends, Scott and Carolyn Scharpen. His vision was to teach and disciple those God is calling to be believers in Jesus Christ, the same vision that continues at Rock Valley today. More than anything, he enjoys personally helping and encouraging others in their walk with Christ. David and Stephanie have been happily married since 1991 and have three children. Scott has served as a Pastor at Rock Valley Christian Church since it was founded. He enjoys the opportunity to get to know people and help them develop their talents and abilities. He is passionate about sharing the love of Jesus, illustrating how God’s Word is relevant in peoples’ lives today, and equipping members in the Body of Christ. Scott graduated from Stanford University with a degree in Economics. His professional experience includes a long career as a healthcare consultant improving hospitals’ financial performance and patient experience. Scott is founder and president of The Scharpen Foundation, a Christian non-profit organization dedicated to helping people in both the Christian and secular communities. Scott also serves as a board member for both for-profit and non-profit organizations. 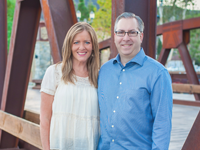 Scott is happily married to his wife, Carolyn, and they enjoy sharing ministry together. Scott & Carolyn have two adult children.